Infantile hemiparesis occurs due to various etiologies such as infarction, malformations, cortical dysplasia, gliosis and microcalcifications. Schizencephaly is an extremely rare developmental disorder which may present as hemiparesis in infants. ,,, A prevalence of schizencephaly of 1.54 in 100,000 was reported in a population-based study in USA. In this neuronal migration disorder, congenital clefts lined by gray matter span through the cerebral hemisphere from the pial surface to the lateral ventricles. In the closed-lip variety, the walls of the cleft are in contact with each other and in the open-lip variety, the walls are separated. Presentation and outcome of children with schizencephaly are quite variable but are related to the extent of cortex involved in the defect. Motor deficits are the predominant manifestations in open-lip schizencephaly. Neuroimaging is useful in identifying the defect and associated malformations. Authors present an open-lip schizencephaly with right hemiparesis in a 7-month-old infant. A 7-month-old infant presented with a history of weakness of the right upper and lower limbs that was noticed by parents 1 month ago. The child preferred to use his left hand more than the right which was always fisted. The child would also cry on stretching the right hand. The child was the second issue of a non-consanguineous marriage, born at term gestation by vaginal route with unremarkable perinatal history. There was no history of seizures, trauma, abnormal color, or odor of the urine. Developmental history revealed a mild delay in gross motor domain and age-appropriate milestones in other developmental domains. On examination, child had a length of 70 cm, weight of 7 kg, and head circumference of 41.5 cm. Central nervous system examination revealed normal cranial nerve examinations and spasticity of right upper and lower limbs with brisk deep tendon reflexes. The power in the right upper and lower limb was 3/5. The rest of the systemic examination was normal. The work-up for infantile hemiplegia was initiated. Complete blood picture, electrolytes, urea, creatinine, serum ammonia, and lactate were normal. Urine metabolic screening for homocystinuria was negative. Ophthalmology and hearing assessment were normal. Magnetic resonance imaging (MRI) brain revealed unilateral, full thickness, gray matter-lined cleft through the left posterior frontal lobe extending from the pial surface of the cerebral mantle to the lateral ventricle suggestive of open-lip schizencephaly [Figure 1]. The gray matter lining the cleft was nodular and patchy-polygyric. The underlying white matter showed fluid-attenuated inversion-recovery (FLAIR) and T2 weighted hyperintense area suggestive of gliosis. Septum pellucidum was absent. Neurosurgeons opined no active intervention. Muscle relaxants (baclofen and diazepam), physiotherapy and occupational therapies were started in view of spasticity. The child had improved symptomatically at follow-up. Schizencephalic clefts are of two types: Type I or closed-lip clefts: with walls opposed to each other and Type II or open-lip clefts: with separated lips and communicating hydrocephalus. They can also be unilateral or bilateral. Type II variety is more common than type I. Presentations are variable, but patients typically exhibit hemiparesis, seizures (57%), and developmental deficits. Seizures are difficult to control in about one-third of cases. Optic nerve hypoplasia if associated may lead to blindness. The severity of manifestations depends on the size and location of the clefts, and the presence of associated cerebral malformations. Timing of presentations also varies. They may present in infancy, childhood or in adults. , In patients with unilateral clefts, hemiparesis of the contralateral side is seen with normal mentation and intelligence. Language development is mostly normal in unilateral schizencephaly than in patients with bilateral clefts. Mental retardation is present mostly in bilateral closed-lips with large brain involvement. Our child had right-sided hemiparesis with normal development except in the gross motor domain as a result of left sided unilateral open-lip schizencephaly. MRI is the imaging modality of choice because of its superior differentiation of gray matter. Identification of gray matter lining the cleft is the pathognomonic finding. Computed tomography (CT) scan and ultrasound can also be used to diagnose schizencephaly. Schizencephaly is commonly associated with absent septum pellucidum (80-90%) and polymicrogyria. Our child had a unilateral left posterior frontal lobe open-lip schizencephaly along with absent septum pellucidum. Treatment involves physiotherapy, seizure control, and ventriculoperitoneal shunt if complicated by hydrocephalus. Prognosis is better for closed-lip variety because they present late in infancy or in adult life. In the open-lip variety, failure to thrive, chronic infections, and respiratory problems may lead to early death. Best neurological outcome is expected in unilateral closed-lip schizencephaly. Schizencephaly can be diagnosed in the prenatal period as early as 23 weeks. Prenatal ultrasound, more specifically prenatal MRI may aid in detection of gray matter lining the defect, communication with the ventricle, and other associated structural abnormalities. 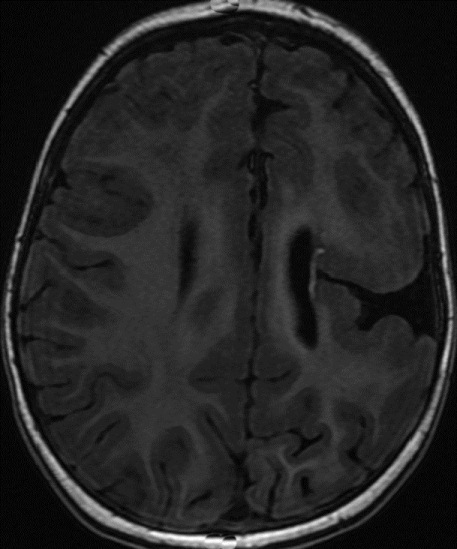 Open-lip schizencephaly should always be considered as a differential for children presenting with unexplained hemiparesis. An early intervention along with muscle relaxants would help in considerable improvement and limit the child's disability. 1. Yakovlev PI, Wadsworth RC. Schizencephalies; a study of the congenital clefts in the cerebral mantle; clefts with fused lips. J Neuropathol Exp Neurol 1946;5:116-30. 2. Curry CJ, Lammer EJ, Nelson V, Shaw GM. Schizencephaly: Heterogeneous etiologies in a population of 4 million California births. Am J Med Genet A 2005;137:181-9. 3. Chhetri PK, Raut S. Schizencephaly: A case report. J College Med Sci Nepal 2010;6:54-6. 4. Denis D, Chateil JF, Brun M, Brissaud O, Lacombe D, Fontan D, et al. Schizencephaly: Clinical and imaging features in 30 infantile cases. Brain Dev 2000;22:475-83. 5. Packard AM, Miller VS, Delgado MR. Schizencephaly: Correlations of clinical and radiologic features. Neurology 1997;48:1427-34. 6. Oh KY, Kennedy AM, Frias AE Jr, Byrne JL. Fetal schizencephaly: Pre- and postnatal imaging with a review of the clinical manifestations. Radiographics 2005;25:647-57.